Temple of Mithras: How do you put London's Roman shrine back together? 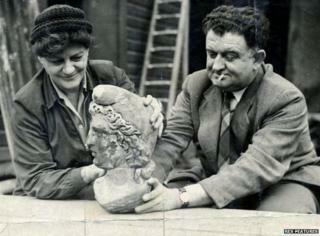 Sixty years ago, a Roman God was uncovered at a London building site. The excavations for the Temple of Mithras moved around but are now going back to the original site - how do you reconstruct a Roman temple, asks Tom de Castella. The muddy find in September 1954 provoked urgent debate. Winston Churchill's cabinet discussed it three times. A huge new office block - for insurance firm Legal & General - was being built on the site of the Temple of Mithras, described as the Roman discovery of the century. Building work was stopped. People would be able to see it for two weeks before the remains were packed up and moved. A few hundred visitors were expected on day one. Instead about 35,000 queued round the block. Advertisers piled in: "In Londinium they believed in Mithras. In London they believe in Shell." Roughly 400,000 people saw it in all. Then the ruins began a peripatetic existence, including a stay at a builders yard in New Malden, before ending up being exhibited in the City 100 metres from where it had been found. Now the ruins are going back whence they came. Media giant Bloomberg is building its European HQ on land that takes in the original site. The Temple of Mithras will be reconstructed underneath the office block at the exact spot it was built in AD240 - ground level in Roman London is seven metres below today's city. The last recreation of the temple - packed up in 2011 - had crazy paving. Not ideal for an all-male Roman cult inspired by Persian religion, says Sophie Jackson, archaeologist at the Museum of Archaeology London. But how do you put a Roman temple back together again? Jackson and her colleagues have good records from 1954 and a team of stone masons to rebuild the temple using the original excavations. But they have no information about the colour of the temple, or the mortar that was used. They are calling on people who saw the 1954 dig to help out and send colour photos, cinefilm or oral memories. Classical scholar Mary Beard is excited, but keen to dispel a myth about Mithras. "Get ready for misinformation: Mithraism NOT secret cult," she tweeted. There is nothing cultish in the modern sense, she explains. He was popular with soldiers - it was a "very blokey" religion - but they would not have hidden their allegiance. Unlike other Roman Gods, such as Jupiter, Mithraism was congregational in nature, Beard adds. There's one more thing. "When it was in the builders yard we know that a lot of items were pinched," says Jackson. So if there's a bit of Roman stone - better still mortar - in Gran's rockery, the Temple of Mithras would like it back.